was punched out from the same side, the 'set' of these ancient saws is unusual and not like the set of a modern rip-pattern saw, which provides a wide 'kerf or saw cut (figure 21). When timber was being converted with these ancient saws, the kerf had to be wedged open to prevent the saw from jamming. Also discovered by Emery were several straight wooden adze shafts and a large number of copper adze blades. The blades were cast in copper and then hammered into a flared shape before the cutting edge was ground on. On some blades both faces were ground with a cutting edge while on others the rake is found only on one side, like a modern plane iron. These blades were attached to their shafts with leather thongs, strips of linen or cord (figure 22). Both mortise and firmer chisels were discovered in this cache of tools (figure 23). 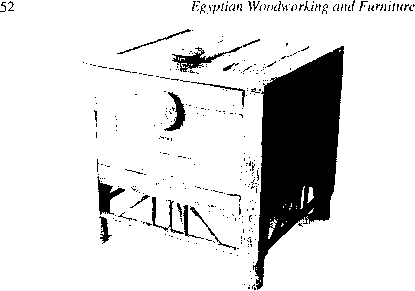 Those used for mortising were struck with wooden mallets and had large cylindrical handles with flat tops. The blades were square in section to prevent them from bending when chips of wood were prised out of deep mortises. The firmer chisel, by contrast, had a handle with a rounded top, which would fit comfortably into the palm of the carpenter's hand, suggesting it was used for handwork and carving. Its blade was rectangular in section and in general this tool was shorter in length than a mortise chisel. Other copper tools discovered were thin-blade awls used to bore holes in timber and some small engraving tools.